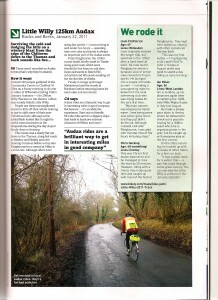 Cycling Active magazine featured Audax. Naturally they turned to the most famous Audax club in the land and so there is an article in the latest edition about the Little Willy ride, a 125km event run in January at the same time as its Willy Warmer big brother. There are usually events of this length within easy reach of West London most weekends and they give a chance to ride in new areas on well chosen routes with company, cakes at the end and a good chance of getting home in time for the football results. Our next 100Km Audax, Mick Hill’s 10 Thames Bridges is coming up Sunday 17th April, and Mick and Rocco are running a series of 100km rides on Wednesdays at roughly monthly intervals throughout the summer. This entry was posted in Audax, Events. Bookmark the permalink.